The Rashba spin-orbit splitting of a hydrogenic donor impurity in GaAs/GaAlAs quantum wells is investigated theoretically in the framework of effective-mass envelope function theory. The Rashba effect near the interface between GaAs and GaAlAs is assumed to be a linear relation with the distance from the quantum well side. We find that the splitting energy of the excited state is larger and less dependent on the position of the impurity than that of the ground state. Our results are useful for the application of Rashba spin-orbit coupling to photoelectric devices. In the framework of effective-mass envelope–function theory, excluding the relativity effect, the electronic states have been studied for a hydrogenic donor impurity in quantum wells (QWs) [1–5] and its important application in the photoelectric devices. The relativity effect introduces evidence of Rashba effects in the semiconductor materials. In recent years, spin-dependent phenomena was also proposed using spin field-effect transistor based on the fact that spin precession can be controlled by an external field due to the spin-orbit interaction . Gvozdić et al. studied efficient switching of Rashba spin splitting in wide modulation-doped quantum wells . They demonstrated that the size of the electric-field induced Rashba spin splitting in an 80-nm wide modulation-doped InGaSb QW depends strongly on the spatial variation of the electric field. The interplay between Rashba, Dresselhaus, and Zeeman interactions in a QW submitted to an external magnetic field was studied by means of an accurate analytical solution of the Hamiltonian . Hashimzade et al. presented a theoretical study of the electronic structure of a CdMnTe quantum dot with Rashba spin-orbit coupling in the presence of a magnetic field. The multiband theory was used to describe electrons in Rashba spin-orbit coupling regimes and an external magnetic field. However, most importantly, many researchers anticipate that Rashba effects can introduce spin splitting of electron energy levels in zero magnetic field. The Rashba term is caused by structural asymmetry, which is a position dependent quantity in a QW, significant near the interface but quickly falling to zero away from the interface. The electron position in the well can be modulated by the impurity center and will sensitively change the Rashba spin-orbit splitting energy. 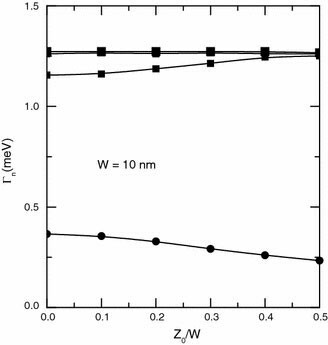 In this letter, we will introduce a linear Rashba spin-orbit coupling module dependent on the electron position in a QW and study the change in spin-orbit splitting energy as the impurity position and the QW width change. where and The third item in Eq. 1 is the contribution of the Rashba spin-orbit effect to the single electron Hamiltonian. , , and , respectively, are the Rashba parameter, the Pauli matrices, and electron momentum operator, respectively. The subscriptn = 0, 1, 2, corresponds to the ground-, first excited-, second-, excited states. The units for length and energy are in terms of the effective Bohr radius and the effective Rydberg constant , where and are the effective mass and dielectric constant of an electron. where W and V0 are the width of the QW and the band offset of the electron, respectively. where α0 is the maximum value of the Rashba spin-orbit effect at the side of the QW. The Rashba parameter is a function of z and is dependent on the size of the QW, which is demonstrated in Fig. 1. In the following sections, using the normalized plane–wave expansion method [10–12], we give numerical results for the Rashba spin-orbit splitting energy of a hydrogenic donor impurity in a QW. We take the effective mass parameters of  and the Rashba parameter . The spin-orbit splitting energy Γ is defined by the difference between the two splitting energy levels. 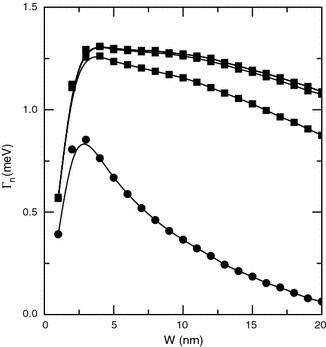 Figure 2shows the change in spin-orbit splitting energy Γ as the GaAs QW width increases for a hydrogenic donor impurity at the QW center under the linear Rashba model along thez direction. The Rashba spin-orbit splitting energy is very small for the narrow QWs. As the well width increases from zero, the splitting energy of the ground state increases first, then reaches a maximum value before decreasing monotonously. This is because the wave function of the ground state is localized at the QW center for the impurity at the QW center and the Rashba effects is very small at the QW center for the wide QWs. However, for the excited states, the wave functions are spread in space and the Rashba effects can affect the excited states for the wide QWs. So the spin-orbit splitting energies of the excited states decrease more slowly than that of the ground state. The spin-orbit splitting energy Γ of the ground state decreases when the impurity moves to the QW side and the impurity positions in the QW do not sensitively affect the spin-orbit splitting energy Γ of the excited states. This is because the ground state is more localizing than the excited states in QWs. These changing trends are found in Fig. 3. In summary, we proposed a linear Rashba model along thez direction and calculated the splitting energy of a hydrogenic donor impurity in a GaAs/GaAlAs QW. We found that the Rashba spin-orbit splitting energy of the ground state is more sensitively dependent on the QW width and the center position of the hydrogen donor impurity than those of the excited states. This work was supported by the National Natural Science Foundation of China under Grant Nos. 60776061, and 60521001.